As I stood at the top of a hill after overcoming an 18% grade climb and heard a bike approaching from behind. I looked over my shoulder to see a tired cyclist approaching who said, That sucked! I laughed and said, Yeah, it sure did, then thought with a smile, Now we get to go down the other side. I hope my legs can hold a skid if needed. I am not trying to use this brake. On the night of July 26th, the forecast was calling for rain. I sat on my couch with a long face anticipating a difficult morning. I didn’t want to ride 50 miles in a deluge and knew I was going to anyway. Who does? But, I agreed to write this article and I would do the ride, not looking forward to the impending sloppy conditions. Fortunately, the next morning did not show a drop and all my previous grieving was in vain. I got my Green Division Projects kit and gear together, looked over my track bike one last time, packed up the car in West Philly and drove north to Firehouse Cycles in Yardley, PA. 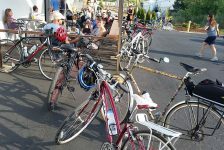 It was July 27, the morning of the first Fixed Gear Fondo. An exciting day! I had never heard of an event specifically focused on fixed gear or single speed bikes that was not a race. I was not too happy about having to install a brake on my track bike, though. I felt like I had shamed my frame even though it was never meant to ride outside of a velodrome anyway. In cycling terms, a Gran Fondo is a cycling event that translates as a Big Ride. Therefore, the Fixed Gear Fondo was a fixed gear ride also open to single speed bicycles and road bikes, subject to a derailleur tax. Brian Ignatin of Kermesse Sport was the organizer behind this ride along with sponsorship support from Firehouse Cycles, Vault Brewing, Garden State Velodrome Association, Trophy Bicycles, Bicycle Revolutions, and Wheelfine. Brian expressed, I planned the event because I have a sick sense of humor! Since fixed gears are so popular, particularly in NYC and Philly, that are mostly flat, I thought it would be interesting to see how riders fared in the hilly countryside. There is also a bit of a rivalry between the so-called hipster/urban types, more serious roadies, and cross racers. However, there is typically a shared love of the bike, an appreciation of fixed gear/single speed and a love of good beer. I thought we could bring everyone together for a fun, difficult, and altogether different day on the bike. When I originally read the information posted about this ride it was described as another stupid idea from the folks that bring you the Hell of Hunterdon, Fools Classic, and the Fleche Buffoon. I was confused. Why would the promoters of an event describe it as a stupid idea? As someone who enjoys riding a track bike with a fixed gear drivetrain, it is an everyday idea for me. However, within cycling culture many people wonder why someone would ride without gears or perhaps a freewheel. 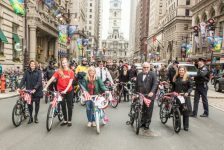 Yet, what is not common knowledge is that The Fixed Gear Fondo is tapping into American cycling history that consisted of six-day races and road criteriums or crits. 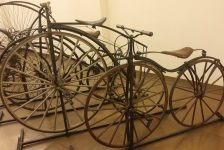 In the late 1800s up until World War II, six-day races were the most popular sport in the United States and every cyclist was on a track bike with a fixed gear drivetrain. Racers would ride in teams of two with each rider racing for 12 hours at a time and teams would cover thousands of miles around the track by the end of six days. In addition, as the website Manual for Speed explains, Criterium racing began in the United States in the 1920s, at a time when track racing was extremely popular throughout the country. There was a time when cycling was very different from the dominant geared road bike forms we find everywhere today. It is refreshing that people are working on ways to bring an American tradition back into popularity. People who ride fixed gear or single speed bikes prefer to ride in the tradition of the founder of the Tour de France, Henri Desgrange, who once said, I still feel that variable gears are only for people over forty-five. Isn’t it better to triumph by the strength of your muscles than by the artifice of a derailleur? We are getting soft. As for me, give me a fixed gear! I wondered if due to the rivalry between fixed riders, roadies and cross racers it would make this event somewhat controversial to organize for Kermesse Sport? Brian stated, The idea for the fondo came about from a conversation I had last year with John Chaki, a former racer, who at 70 years old was our oldest registrant. Well into the 1950s most road racing and crits in the US were conducted on fixed gear bikes. John even competed in an event in the 1980s that was restricted to fixed gears and single speeds. Red Hook Crit has set the standard for modern fixed gear crits, so I thought we’d do a traditional road event. These are generally more fun than true road races anyway. I bounced the idea off Fuzzy of Bicycle Revolutions, and he thought it was great. So we moved forward with it. To test out the concept, we didn’t widely publicize the event for the first year. But, since it was well received by those that participated we plan to expand it greatly in 2015. For this first Fixed Gear Fondo, 32 cyclists came together with 17 riding fixed, 12 riding single speed, one geared road bike, and one 20 BMX bike, all of whom successfully traversed the 50-mile route  a route that felt big even though Gran was not in the title. On this ride gear ratio was particularly important due to the hilly countryside and the lack of options on bicycles without derailleurs. Each rider is then forced to be responsible for a choice in gear ratio that would allow that particular cyclist to finish the ride. Ratios from 49/16, 48/16; that seemed to be the most popular, all the way to 50/25 making gear inches range from 82.7 to shorter than 65. Everyone who participated had to have at least one handbrake on his or her bike. Yet, regardless of gear ratio or brakes, this style of riding pushes each cyclist to be more responsible for his or her success in the long run. The route was not particularly easy by any means but it was certainly scenic and beautiful. A group of five riders took off quickly from the start and formed their own lead group setting a tough pace. I worked as best I could to catch up with them all while wondering why. This was not a race. But, some people just like to ride fast and fast they were. One member of the group hit a pothole around mile five and a graceful fall still left him with a few scrapes and bruises. We all slowed down to be sure he was okay. He told us to continue on as he would need a short rest and we were off again. Around mile 15, I lost the remaining four from the group due to a particularly difficult climb with an 18% grade. This hill was tough. I was getting dizzy working so hard and finally I could barely get the gear to turn. My mouth was wide open like a whale shark sucking in air to the deepest part of my lungs and still, not enough air would get into my blood to push the bike. I had to stop in the middle of this climb, without stepping over my bike to catch my breath before I could continue up and finish. I made it and screamed down a steep descent with legs spinning rpm’s on the pedals. The rest of the ride I was alone. There were other challenging parts but nothing was as difficult as that climb. I passed a diverse environment consisting of woods, open fields, tall corn, a shooting range, more tough climbs, more fun and fast descents, the Delaware River, a dead baby deer, a section of gravel road to skid on and only one honking driver who got a good look at the logo on the middle finger of my glove. By the end of the ride I felt fortunate to have had the experience. I was glad that a ride like this had been organized and to see the different track bikes that were brought out for the day. I made new friends, and I am looking forward to going back next year.